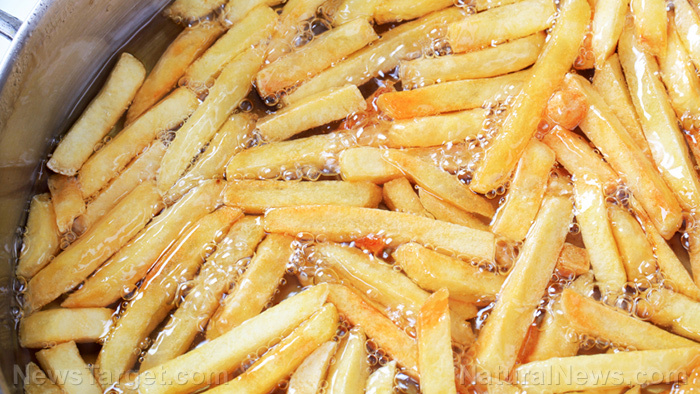 (Natural News) Fried potatoes and other foods cooked at high temperatures significantly increase cancer risk, according to research. Because of this, the Food Standards Agency (FSA), a government body in the U.K., issued a public warning over the risks of these foods. When foods are cooked at high temperatures or over 120 degrees Celsius, a chemical compound called acrylamide forms. This chemical compound can trigger cancer cell growth. Fried foods, especially fried potatoes, contain the highest amounts of acrylamide. Apparently, acrylamide can also be found in other foods, such as packed crackers, cookies, dry cereals, toasted nuts, peanut butter, canned black olives, prune juice, and roasted cocoa beans. The chemical compound is also found in bread crusts and many foods that are roasted, such as nuts. Acrylamide arises in certain carbohydrates, proteins, and starchy foods that are exposed to high or prolonged heat during processing or cooking. it is formed when simple sugars, such as glucose, exposed to intense heat react with the amino acid asparagine. In line with the FSA’s warning, the government body also suggested simple ways to reduce people’s consumption of acrylamide. One of the ways to avoid acrylamide formation in foods is to aim for a golden yellow color or lighten when frying, roasting, baking, or toasting starchy foods. People should also follow the cooking instructions on packaging properly to ensure that foods are not cooked for too long or at extreme temperatures. The FSA also advised that raw potatoes should not be kept in the fridge. Putting potatoes in the fridge can increase overall levels of acrylamide. Rather, raw potatoes should be stored in a dark, cool place with temperatures over 6C. In addition, potatoes should not be stored for a long period because more acrylamide can form. Other ways to reduce acrylamide consumption include eating chunky chips on occasion instead of fries. Moreover, cutting potatoes into larger wedges decreases their surface area, thus reducing the level of acrylamide that can form. To reduce one’s overall risk of cancer, adhere to a varied, balanced diet. Cancer is not the only risk of eating fried potatoes. It can also increase the risk of early death. A study published in the journal American Journal of Clinical Nutrition found that people who eat fried potatoes two or more times each week could increase their risk of premature death by two times. Researchers in Italy analyzed the data of 4,440 adults who participated in the Osteoarthritis Initiative (OAI) cohort study. The participants were between the ages of 45 and 79 at the beginning of the study, and they were followed up for an average of eight years. They were tasked to accomplish a food frequency questionnaire as part of the OAI study. Researchers of the current study used these data to measure the participants’ total weekly potato intake and weekly consumption of fried and unfried potatoes. During the follow-up period, a total of 236 participants died. Although overall potato consumption did not affect their death risk, consumption of two to three portions of fried potatoes like french fries, potato chips, or hash browns every week doubled the risk of early death. Eating more than three portions further increased the risk. There was no link found between the consumption of unfried potatoes and early death risk. Read more news stories and studies on cancer-causing foods by going to CancerCauses.news.